It is an immoral piece of legislative chutzpah that hides taxpayer-funded abortion in its 2700 pages of Rube Goldberg-inspired legalese. It has led to the imposition of services on Catholics and other people of faith that force them to violate their conscience or face severe sanctions from the State. And it was sold as a way to reduce our federal deficits. It turns out, according to the Congressional Budget Office, that the president and his party were wrong. Obamacare is going to bust our already shattered bank and grind us into the scrap heap of history. Yesterday, the Court said most of the legislation, including the mandate, was legal. 1. The Commerce Clause of the Constitution has been weakened. Congress has used this clause to expand the power of the federal government far beyond what our Founding Fathers ever intended. All four liberal judges on the bench concurred with Judge Robert’s reasoning. Hence, future liberal Congresses will have difficulties using this clause as the rationale for expanding the federal government. 2. Conservatives are energized to a fever pitch. Obamacare must be rescinded for economic and moral reasons. We will turn out in droves in November. We believe the fate of the republic depends on it, because it does. President Obama’s sneering insistence that the mandate wasn’t a tax has been exposed for the fraud we already knew it was. 3. The future of the Court has been strengthened for conservatives. Two liberal and two conservative judges are old. The next president may have an opportunity to appoint several new justices. A President Romney would have had a very difficult time getting his nominees past the Senate had a conservative court struck down Obamacare. The payback that Senate Democrats would want to inflict would be severe enough to thwart Romney at every turn. A less doctrinaire Justice Roberts increases the odds that future Republican nominees will past muster with Senate liberals. But maybe even less bearable than the cost will be the Gestapo-like intrusion into free citizens’ private lives. When I tell US audiences on Talk Radio that in Britain now we actually have microchips installed by local authorities in our dustbins so as to monitor the ecological correctness of our waste disposal, I’m sure they think I’m exaggerating. It’s true, though, and it’s a typically shameful example of the bullying, controlling instinct behind so much nurturing, caring green ideology. Please tell me you are kidding about the dustbins. Maybe Roberts did the Republican conservatives a huge favor by “outing” Obama who has INSISTED all along that Obamacare wasn’t a tax. Maybe enough people will be riled enough to send him packing come November. For those who currently have health insurance don’t be so sure you’ll keep it. How many insurance companies will be raising premiums causing small businesses to eliminate that little perk? 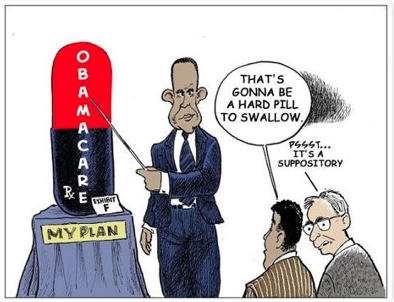 Eventually Obamacare will be the only affordable option left! And shoot me for being a conspiracy theorists but I’m guessin that’s been the plan all along. A whole lot can happen. I am cautiously optimistic. Excellent positive points. The second part of the court challenge had to do with the Medicaid expansion.within this Act. Wouldn’t we also say that one positive outcome was the declaration that the feds were overstepping their authority with the threat of removing ALL Medicaid funds to states that did not agree to the EXPANSION of Medicaid? I appreciate the positive take and points you made in this post. Although the commerce clause was weakened, the Congress’ power to continue to “tax and destroy” has unfortunately been enhanced. And since I know you are a person of faith, think about the implications on religion for those who choose through faith not to use the medical system, for example people (including our former Treasury Secretary Henry Paulsen) who are Christian Scientists among others. Yes, the tax and destroy power is disturbing, but higher taxes are a harder sell to the American public. Congress has to tread lightly because they have to face voters on a regular basis who feel they are already taxed enough. It’s always nice to look at the bright side, and the restriction of the commerce clause was refreshing, but I’m still worried. The way things are going, I’d be shocked if there is a full repeal. And while the Republican base is fired up, public opinion generally follows the law. Public opinion against the law hasn’t wavered for two years. I hope that provides Republicans with the courage to repeal and replace it. Certainly. I hope so as well but I’m not going to be overly optimistic. I wrote some rambling thoughts on the issue over at my blog – clears up what I was thinking.